Two boys, aged 12 and 16, have been released under investigation after a car crash injured a six-year-old girl. 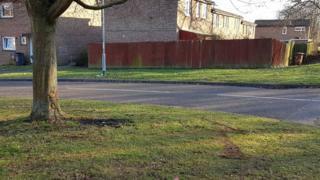 She was a passenger in the car which hit a tree in Croftmeadow Court, Northampton, at 16:40 GMT on Thursday. The boys were questioned on suspicion of theft of a motor vehicle, causing serious injury by dangerous driving and failing to stop. Northamptonshire Police said the girl was taken to Northampton General Hospital with minor injuries. A spokeswoman for East Midlands Ambulance Service said: "We sent a medical first responder, a paramedic in an ambulance car, a crewed ambulance and the air ambulance." Tyre tracks and the aftermath of a small fire could be seen next to a tree on the street, which one resident described as being in a "fairly quiet area". Police have appealed for anyone with information about the incident to come forward.